Adolescence by its very nature is a time of growth and decay. Growth in the sense that they are moving towards adulthood, and decay as they shed the shell of childhood. Our children begin to pull away from us around the age of two and continue on the path towards healthy independence. We as adults in their lives need to recognize this natural path and manage the need for them to be safe and the need for them to take healthy risks. 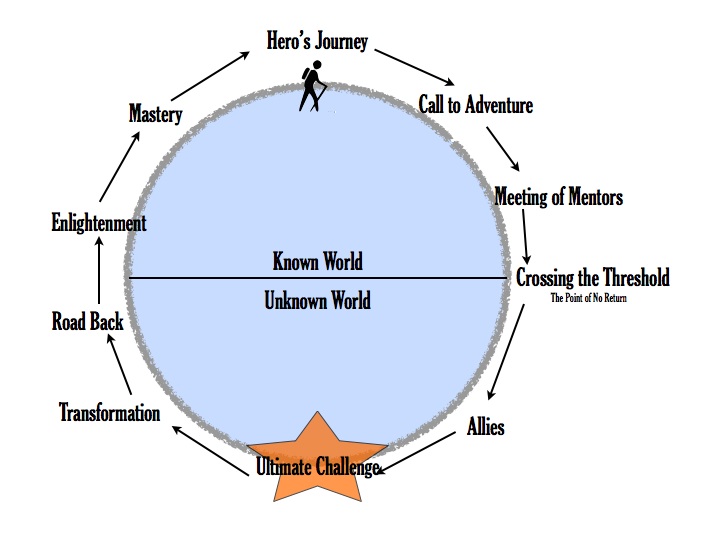 One useful model for understanding this concept is the work done by Joseph Campbell, in his book: The Hero with a Thousand Faces where he introduces the concept of the Hero’s Journey. The budding hero goes out into the world and separates from the familiar and experiences life in a way that may challenge his/her faith, assumptions, perspectives, and beliefs. Along the way our hero builds allies, encounters monsters and tests ending with the successful return to the familiar world changed. Sometimes this change is profound, sometimes it is minuscule nevertheless change is inevitable. As the graphic illustrates our youth comes back to the real world and is led down the pathway once again. As Campbell notes, this mono-myth is common to all cultures with small variations that are culturally specific. 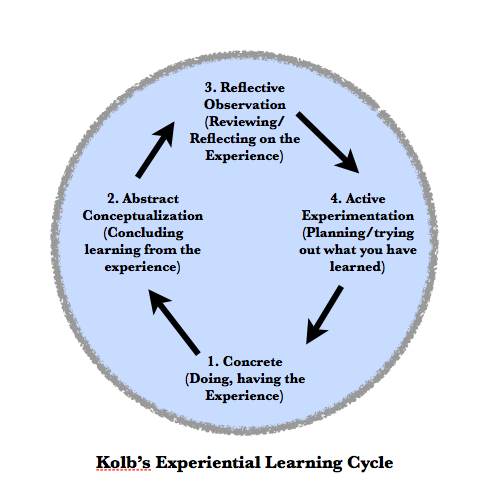 Kolb’s Experiential Learning Cycle gives us insight into how to effectively process learning experiences. He built this concept based on John Dewey’s Experience in Education. Dewey’s key concepts in learning are: Continuity and Interaction. Basically humans learn from every experience (Continuity) and that past experiences influence our future learning (Interaction). 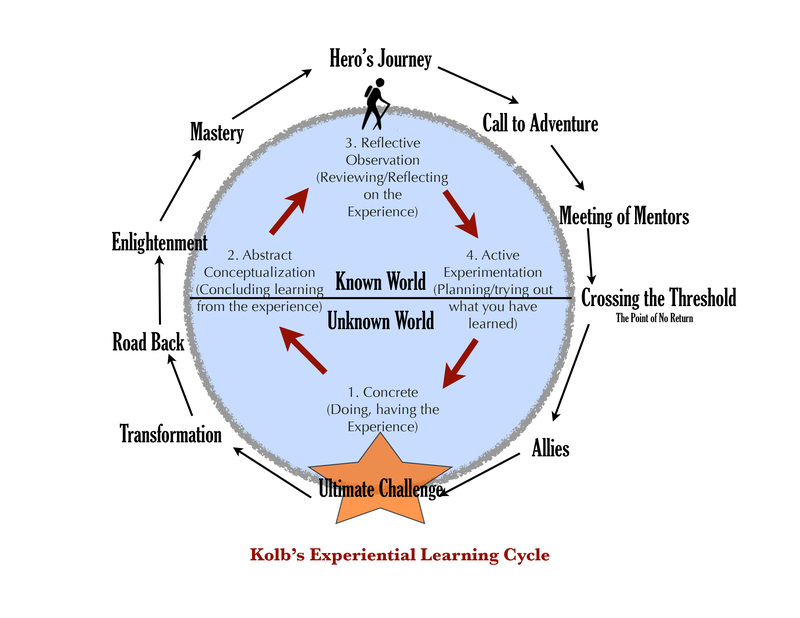 Kolb takes this a step further and charges facilitators to help student process the experience and systematically connect the current experiences with past and to look forward to how they will handle future events. If we overlay the Hero’s Journey and Give Kolb’s Cycle a small rotation, we can see our these two models developed by different men actually support one another. The adolescent journey is not an optional task. All our students will go through this process. It is our task as educators (Mentors) to help the youth in our community to accept the Call to Adventure. In doing so we may become the Obi Wan to the kid that saves the Galaxy. Once upon a time there was a family who went on a boat to go to an island called Tiritiri Matangi in New Zealand. The ferry ride was very long. We packed our backpacks so we could stay overnight in the bunkhouse on the island. We got off the boat and it was kinda like a magical land. A lady took us around on a trail and she taught us a lot about the birds and trees. We saw a lot of bugs. The birds eat the bugs. There are not a lot of animals that eat the birds so they are all family. We saw a lot and a lot of flowers and trees. A lot of birds had to have little tags on their legs because they don’t want them to get lost. They want to count the birds. We went on a long trail to get to the bunkhouse. We unpacked our stuff and went on a hike to the beach and it was real far away. I got dive bombed from a huge New Zealand Pigeon. It was like he wanted to get our heads. We went to the beach and no one was there. We saw a huge cave at the beach. We found cool shells on the beach. On the hike back we thought we were lost but then we found the bunkhouse. We shared the dining room and the kitchen to make dinner and we sat with people and we talked to them. We slept in bunk beds. There was another lady that slept in our room but she woke up really early and we didn’t see her when we woke up. On this day we went on another hike and we saw a lady who put more tags on a bird and it was so cute. She caught it in the bird feeder. She pulled up the wing and gave it a shot. She measured the bird and it’s weight and it’s wing span and how old it is. Then we went walking more and we saw a big huge tree and it was really old like 800 years old. I saw a huge owl and Finn saw a bird that looked like a green Parrot. Then we went to another beach and played in the water and ate lunch. When we went back it was time to go home but we saw a box with baby Blue Penguins. We could look into it but it stunk really bad. The island was real pretty. It looked like a huge fairy tale. And then they went on the boat back to the city of Auckland. And they lived happily ever after.